A taste of Greece: Roula and Sotiris Zafiropoulos in their Chicken Wizard take away at Mt Annan. A taste of Greek summer has found a home in Mt Annan. For the past month or so the lovely aromas of Roula Zafiropoulos’ home cooked Greek food has been enticing local residents to a new fast food outlet in the southern part of Mt Annan shopping centre (where Coles is located). 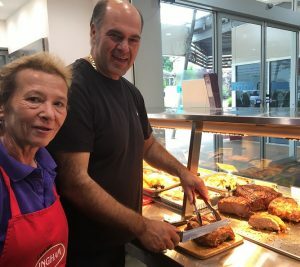 Roula and her husband Sotiris opened Chicken Wizard Mount Annan and made sure they included some delicious Greek classics as part of their offerings. There’s magnificent looking Greek salad, stuffed cabbage rolls and tomatoes and tiropites (cheese pasties) among the Greek offerings at Chicken Wizard Mount Annan. And so far the locals have given it a big thumbs up. “The reaction from locals since we opened has been very, very good,’’ says Sotiris. Both Roula and Sotiris are passionate about preparing and serving great quality food – which is no surprise considering their Greek heritage. Most of the food is made on the premises, including the meat roasts, although Sotiris admits “we buy the meat of course’’. “For the moment everything is very popular, the salads, chickens, the meat roasts, everything we have is going well so far,’’ says Sotiris. 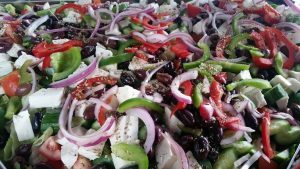 Roula makes one of the best Greek salads this side of the Mediterranean. The couple opened their first take away store in Rockdale 35 years ago, and then another one in Kings Cross. Roula and Sotiris then opened Chicken Wizard in Panania before moving to Macarthur to live. “The kids moved here, the parents followed and so there was an opportunity for them to start a new business here,’’ says son in law Paul Condoleon. He says Roula and Sotiris have always been community minded and it will be no different in Mt Annan. “We are already looking into how we can make a contribution to the local community through schools and sporting clubs,’’ he says. Bringing a taste of delicious Greek food to Macarthur is a pretty good start. Chicken Wizard Mount Annan is located at Shop 8, 1 Raintree Way, Mount Annan.